Love, Duty and Loyalty Collide to Determine King Edward II's Future in the Medieval Historical Romance, The Lion and the Leopard. Maria Rendell is determined to be a dutiful wife to her husband, Phillip, though she can't deny her attraction to Richard, Earl of Sussex, their liege lord and Edward II’s illegitimate half-brother. Loving Philip should be easy for he is the knight of whom minstrels sing; the knight who saved the Earl of Sussex's life at the Battle of Bannockburn. However, when Phillip abandons Maria to indulge his wanderlust, she turns to the powerful earl, sparking a scandalous affair that unfolds during the last perilous months of Edward II’s disastrous reign. After England’s mutinous barons turn against the king, capture him and execute his favorites, Richard of Sussex tries unsuccessfully to rally public support for his half-brother. When Maria’s wayward husband unexpectedly returns, the day of reckoning is at hand--for Maria, Richard, Phillip, and that most unfortunate of Plantagenet kings, Edward Caernarvon. 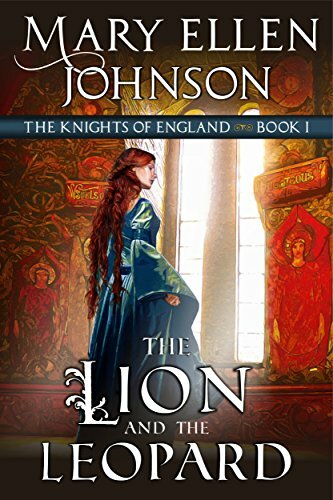 THE LION AND THE LEOPARD is the first of the six book series, THE KNIGHTS OF ENGLAND, which spans the tumultuous 14th century--including that most magnificent of medieval kings, Edward III and his son, The Black Prince. In between we have the Black Death, the Peasants’ Revolt of 1381, the brilliant, bloody and brutal campaigns against the French that marked the beginning of the Hundred Years War, civil wars and the deposition and the murder of two English kings! Read "The Lion and the Leopard" by Mary Ellen Johnson on Kindle Today!